Since the invention of the Internet, part of our social life exists online. Catching up with friends, looking for jobs but also the search for a relationship is now taking place online. After the first mobile phone app was developed, it did not take long for the first dating app to become available. Though Tinder was not the first dating app, it currently is one of the most used dating apps with over 50 million users everyday. When looking for a partner, one has preferences for what he or she likes in a partner as well as preferences for looks. As individuals prefer to be surrounded by others with the same social position, and same cultural taste. Therefore it makes sense people look for partners of the same social position on dating apps. Based on the distinction theory by Bourdieu, people in different social classes have different ways of distinguishing themselves, showing to which layer they belong or trying to pretend to belong to a higher class than they actually do. The act of distinguishing oneself, and possible pretending to belong to a higher class, can be linked to the theory of self-presentation by Goffman. Self-presentation and impression management is the basis of any dating app. It is interesting to see how people from different social strata portray themselves, aiming to attract people of similar social class and the main question of this research therefore states: What is the relationship between educational level and online self-presentation of male Tinder users, (age 25-35) in the Netherlands? For this research the two concepts, distinction and self-presentation have been combined, aiming to contribute to the on-going discussion on the relevance of Bourdieu’s distinction theory. By observing and testing various theoretical concepts, this research provides insight on the reproduction of social inequality through online dating, as people tend to date others from the same social class. Furthermore, it translates the theory by Goffman into a concept of online self-presentation, which is interesting since social life is more and more taking place online. 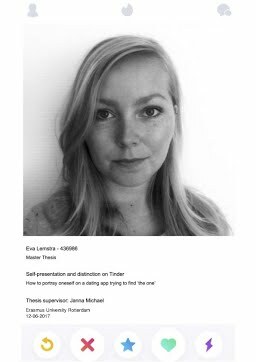 The relevance of this research for society, is the on-going use and still growing popularity of dating apps like Tinder, of which many aspects are not fully explored yet.